Through direction from the Nisga’a Lisims Government, and in collaboration with the Gitanyow, Gitxsan, and Lax Kw'alaams First Nations, Fisheries and Oceans Canada, BC Ministry of Environment, ESSA Technologies, and other local experts, the Pacific Salmon Foundation coordinated an assessment of landscape-scale pressures and the resulting risks to salmon habitat in the Nass Area of northern British Columbia. 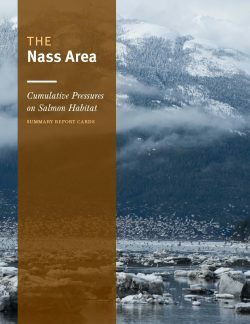 Summarize the relative vulnerability of habitats used by Nass salmon CUs during the different life-history stages posed by these pressures. 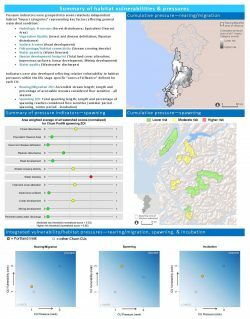 Collectively, the report cards provide a snapshot of the current risks to salmon habitat in the Nass Area from different human and environmental pressures. 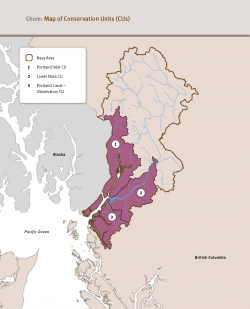 This type of coarse-scale assessment is useful for building a common understanding of the degree of stress to key salmon habitats and for identifying strategies for alleviating those stresses.